The optimizer is the heart and soul of DB2. It analyzes SQL statements and determines the most efficient access path available for satisfying each statement (see Figure 1). DB2 UDB accomplishes this by parsing the SQL statement to determine which tables and columns must be accessed. The DB2 optimizer then queries system information and statistics stored in the DB2 system catalog to determine the best method of accomplishing the tasks necessary to satisfy the SQL request. Figure 1. DB2 optimization in action. The optimizer is equivalent in function to an expert system. An expert system is a set of standard rules that, when combined with situational data, returns an "expert" opinion. For example, a medical expert system takes the set of rules determining which medication is useful for which illness, combines it with data describing the symptoms of ailments, and applies that knowledge base to a list of input symptoms. The DB2 optimizer renders expert opinions on data retrieval methods based on the situational data housed in DB2's system catalog and a query input in SQL format. The notion of optimizing data access in the DBMS is one of the most powerful capabilities of DB2. Remember, you access DB2 data by telling DB2 what to retrieve, not how to retrieve it. Regardless of how the data is physically stored and manipulated, DB2 and SQL can still access that data. This separation of access criteria from physical storage characteristics is called physical data independence. DB2's optimizer is the component that accomplishes this physical data independence. If you remove the indexes, DB2 can still access the data (although less efficiently). If you add a column to the table being accessed, DB2 can still manipulate the data without changing the program code. This is all possible because the physical access paths to DB2 data are not coded by programmers in application programs, but are generated by DB2. Compare this with non-DBMS systems in which the programmer must know the physical structure of the data. If there is an index, the programmer must write appropriate code to use the index. If someone removes the index, the program will not work unless the programmer makes changes. Not so with DB2 and SQL. All this flexibility is attributable to DB2's capability to optimize data manipulation requests automatically. Receive and verify the syntax of the SQL statement. Analyze the environment and optimize the method of satisfying the SQL statement. Create machine-readable instructions to execute the optimized SQL. Execute the instructions or store them for future execution. The second step of this process is the most intriguing. How does the optimizer decide how to execute the vast array of SQL statements that you can send its way? The optimizer has many types of strategies for optimizing SQL. How does it choose which of these strategies to use in the optimized access paths? IBM does not publish the actual, in-depth details of how the optimizer determines the best access path, but the optimizer is a cost-based optimizer. This means the optimizer will always attempt to formulate an access path for each query that reduces overall cost. 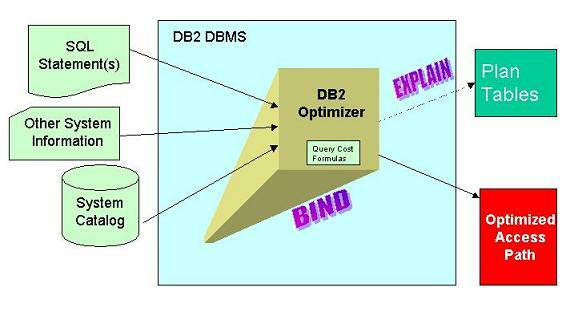 To accomplish this, the DB2 optimizer applies query cost formulas that evaluate and weigh four factors for each potential access path: the CPU cost, the I/O cost, statistical information in the DB2 system catalog, and the actual SQL statement.